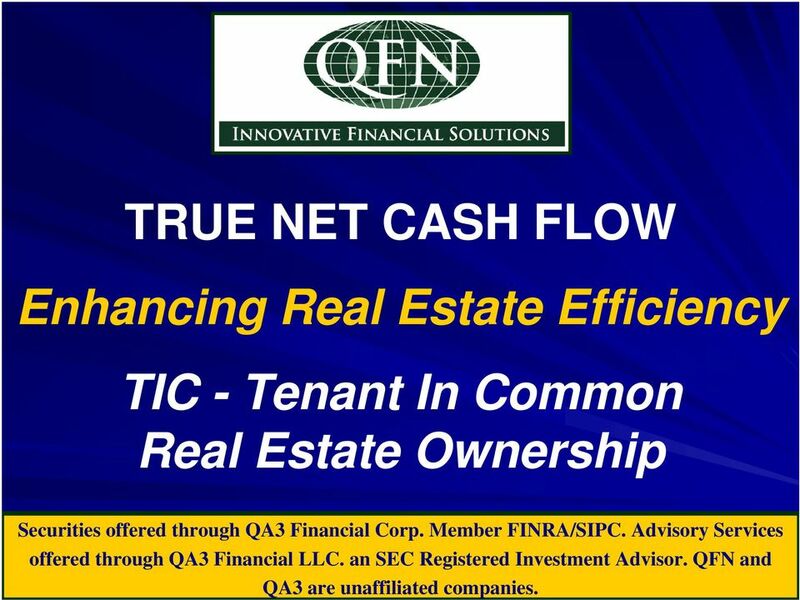 Download "TRUE NET CASH FLOW Enhancing Real Estate Efficiency TIC - Tenant In Common Real Estate Ownership"
1 TRUE NET CASH FLOW Enhancing Real Estate Efficiency TIC - Tenant In Common Real Estate Ownership Securities offered through QA3 Financial Corp. Member FINRA/SIPC. Advisory Services offered through QA3 Financial LLC. an SEC Registered Investment Advisor. QFN and QA3 are unaffiliated companies. 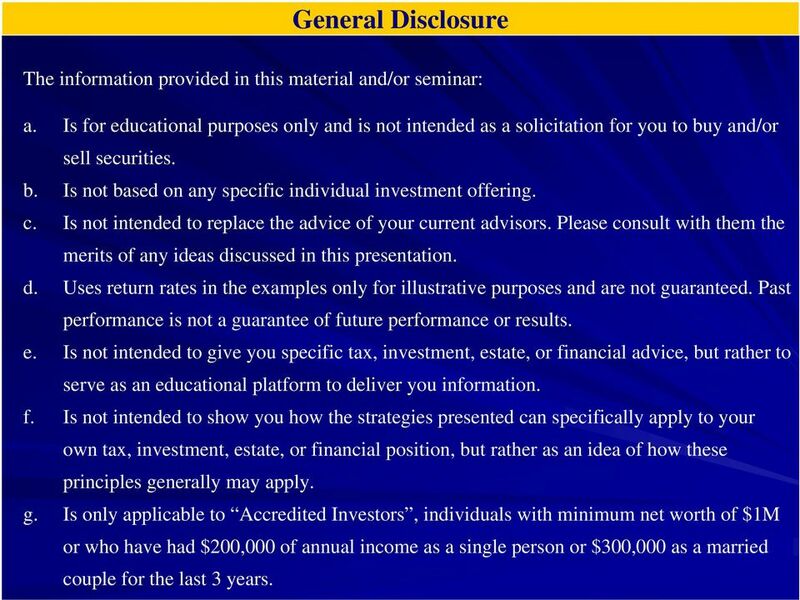 2 General Disclosure The information provided in this material and/or seminar: a. Is for educational purposes only and is not intended as a solicitation for you to buy and/or sell securities. b. Is not based on any specific individual investment offering. c. Is not intended to replace the advice of your current advisors. Please consult with them the merits of any ideas discussed in this presentation. d. Uses return rates in the examples only for illustrative purposes and are not guaranteed. Past performance is not a guarantee of future performance or results. e. Is not intended to give you specific tax, investment, estate, or financial advice, but rather to serve as an educational platform to deliver you information. f. Is not intended to show you how the strategies presented can specifically apply to your own tax, investment, estate, or financial position, but rather as an idea of how these principles generally may apply. g. Is only applicable to Accredited Investors, individuals with minimum net worth of $1M or who have had $200,000 of annual income as a single person or $300,000 as a married couple for the last 3 years. 3 Why We Are Here 1. 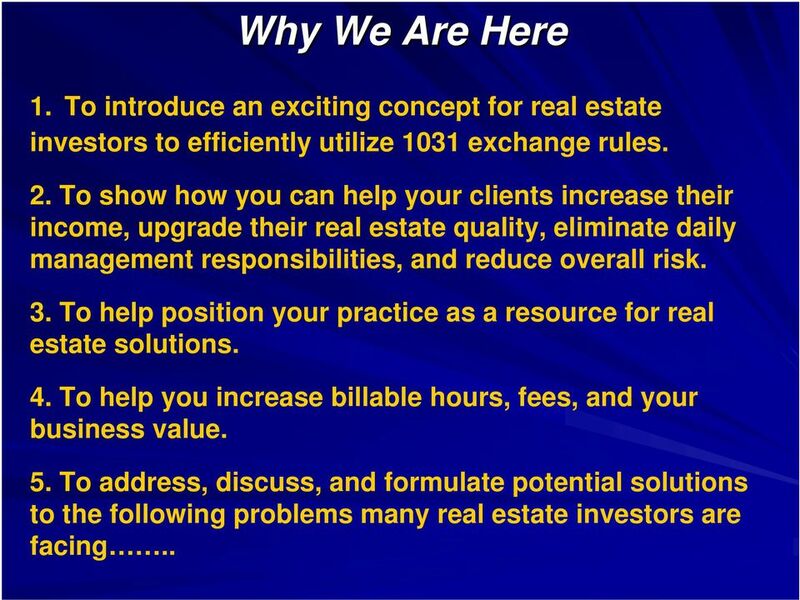 To introduce an exciting concept for real estate investors to efficiently utilize 1031 exchange rules. 2. To show how you can help your clients increase their income, upgrade their real estate quality, eliminate daily management responsibilities, and reduce overall risk. 3. To help position your practice as a resource for real estate solutions. 4. To help you increase billable hours, fees, and your business value. 5. 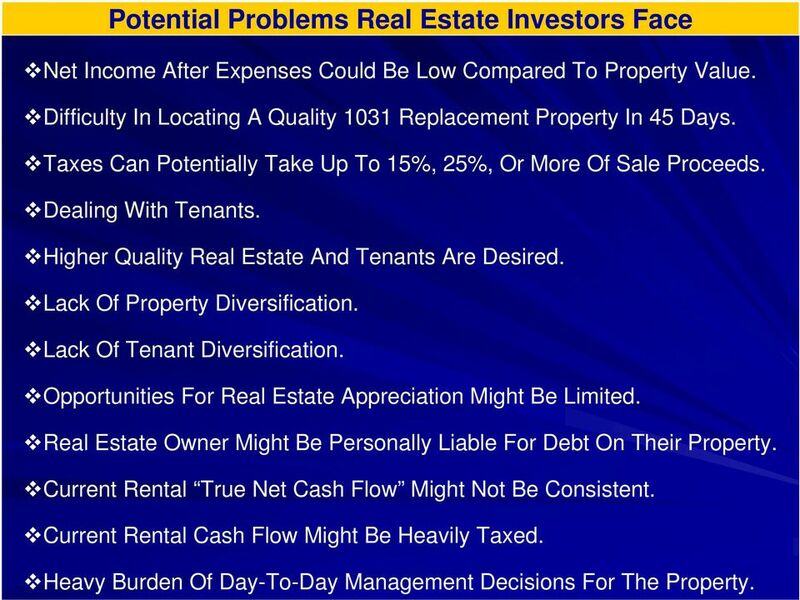 To address, discuss, and formulate potential solutions to the following problems many real estate investors are facing..
4 Potential Problems Real Estate Investors Face Net Income After Expenses Could Be Low Compared To Property Value. Difficulty In Locating A Quality 1031 Replacement Property In 45 Days. Taxes Can Potentially Take Up To 15%, 25%, Or More Of Sale Proceeds. Dealing With Tenants. Higher Quality Real Estate And Tenants Are Desired. Lack Of Property Diversification. Lack Of Tenant Diversification. Opportunities For Real Estate Appreciation Might Be Limited. Real Estate Owner Might Be Personally Liable For Debt On Their Property. Current Rental True Net Cash Flow Might Not Be Consistent. Current Rental Cash Flow Might Be Heavily Taxed. Heavy Burden Of Day-To-Day Management Decisions For The Property. 5 What Is A Standard 1031 Tax-Deferred Exchange? 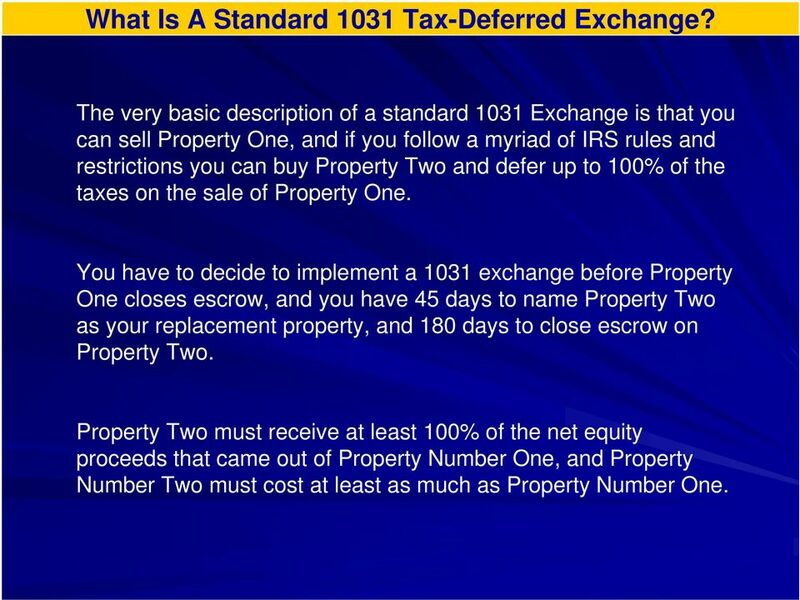 The very basic description of a standard 1031 Exchange is that you can sell Property One, and if you follow a myriad of IRS rules and restrictions you can buy Property Two and defer up to 100% of the taxes on the sale of Property One. 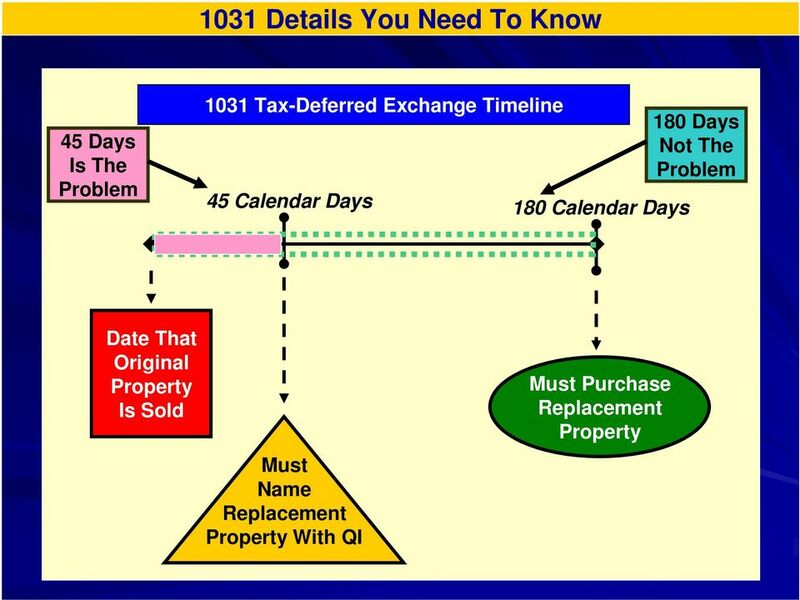 You have to decide to implement a 1031 exchange before Property One closes escrow, and you have 45 days to name Property Two as your replacement property, and 180 days to close escrow on Property Two. Property Two must receive at least 100% of the net equity proceeds that came out of Property Number One, and Property Number Two must cost at least as much as Property Number One. 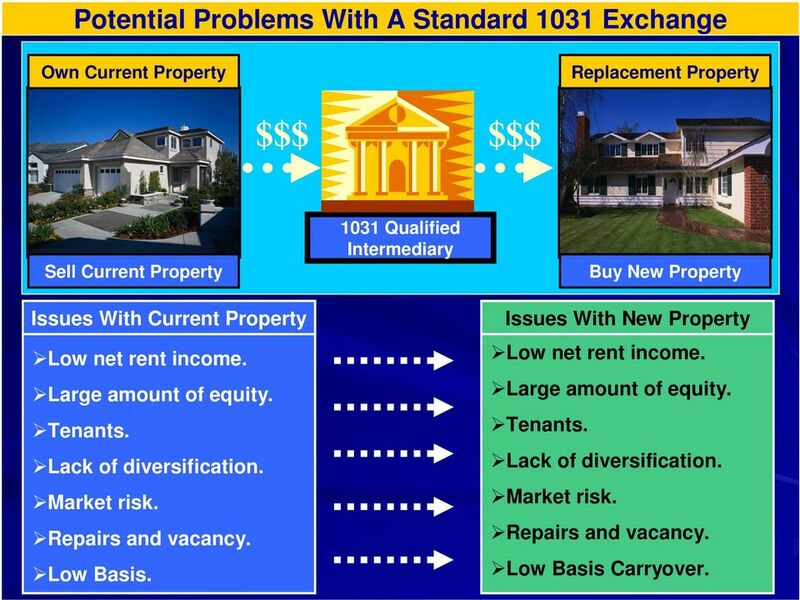 7 Potential Problems With A Standard 1031 Exchange Own Current Property Replacement Property $$$ $$$ Sell Current Property Issues With Current Property Low net rent income. Large amount of equity. Tenants. Lack of diversification. Market risk. Repairs and vacancy. Low Basis Qualified Intermediary Buy New Property Issues With New Property Low net rent income. Large amount of equity. Tenants. Lack of diversification. Market risk. Repairs and vacancy. Low Basis Carryover. 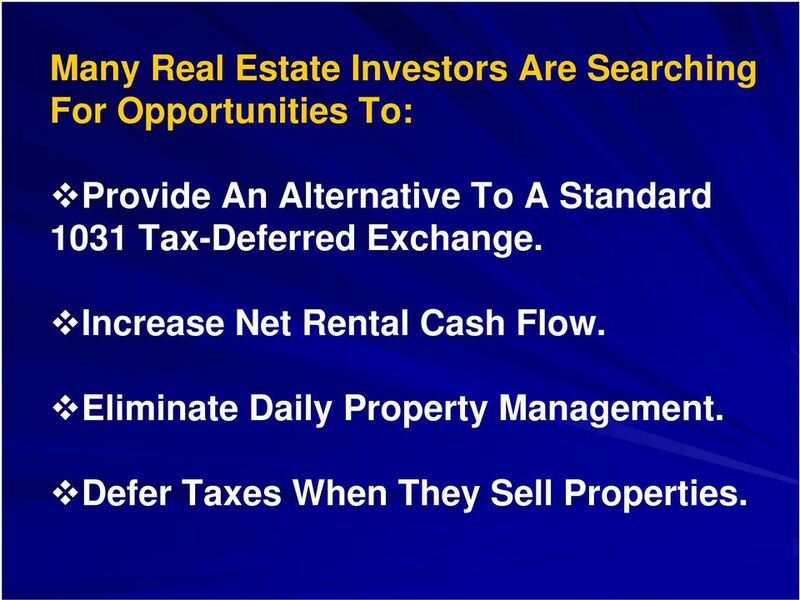 8 Many Real Estate Investors Are Searching For Opportunities To: Provide An Alternative To A Standard 1031 Tax-Deferred Exchange. Increase Net Rental Cash Flow. Eliminate Daily Property Management. Defer Taxes When They Sell Properties. 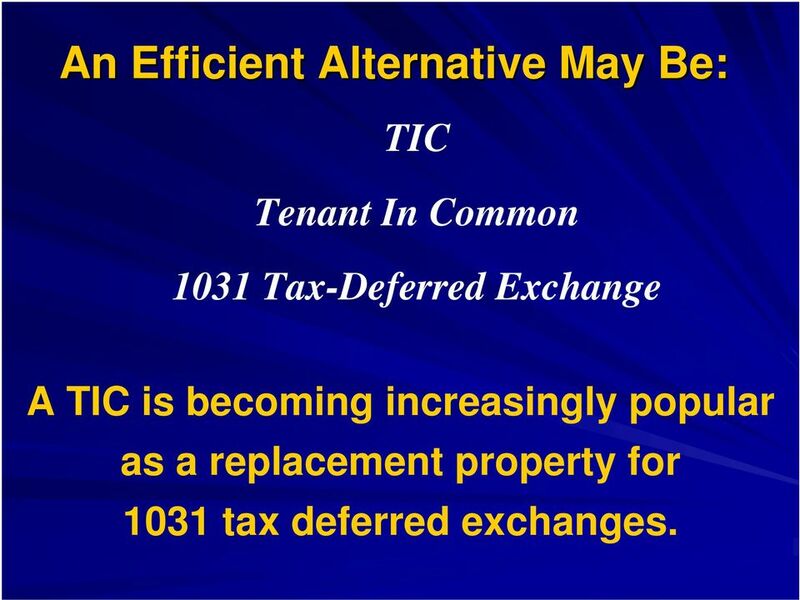 9 An Efficient Alternative May Be: TIC Tenant In Common 1031 Tax-Deferred Exchange A TIC is becoming increasingly popular as a replacement property for 1031 tax deferred exchanges. 13 What Is A TIC Tenant In Common? 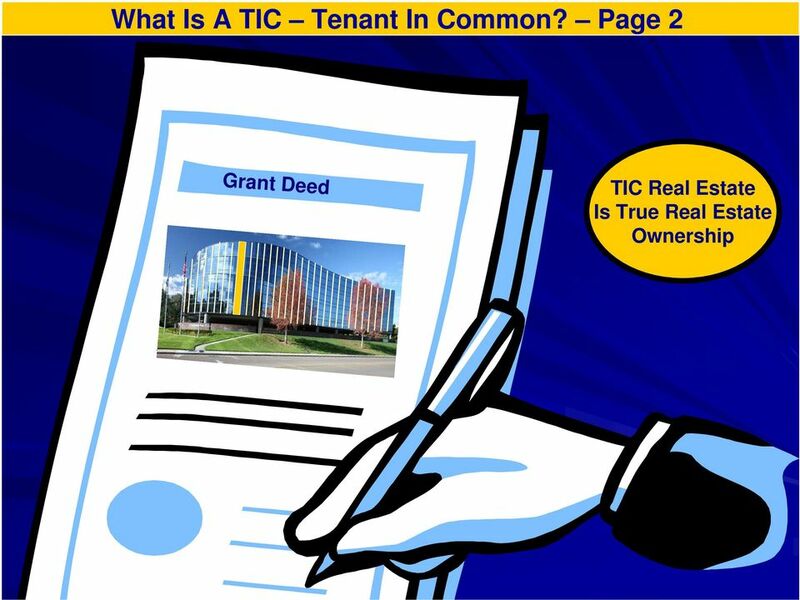 Page 4 TIC ownership is the co-ownership of property by 2 or more investors. 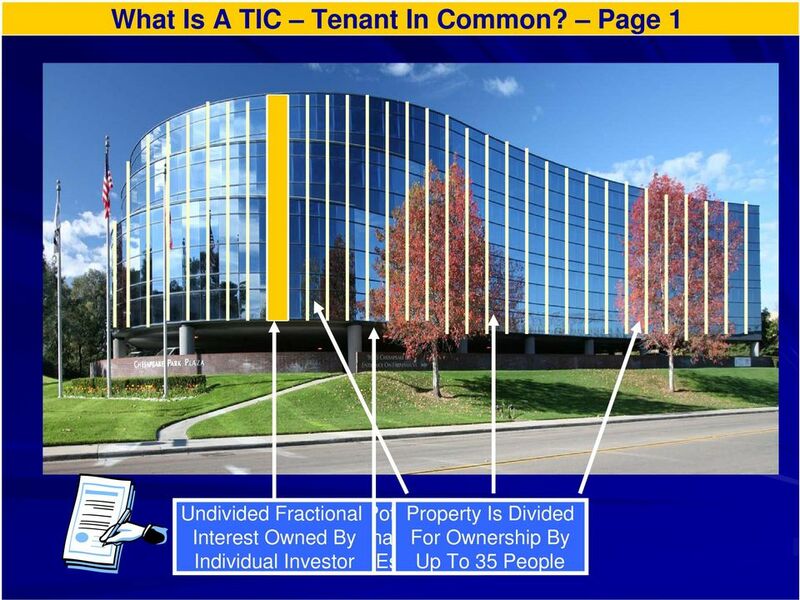 Each TIC owner owns an undivided fractional interest in the real estate. Each owner receives his/her share of net income, deductions, & appreciation. Each owner must bear his/her equivalent share of expenses. Interests may be unequal in quantity & duration & may arise at different times. Each co-tenant may sell, lease or will his/her beneficiary(ies) their interest. 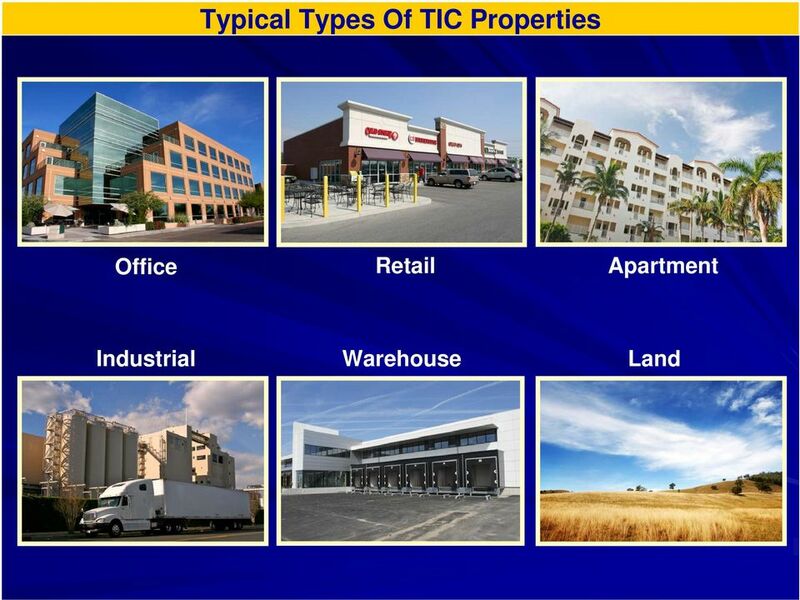 Title is held by each TIC owner rather than by a corporation or partnership. Each owner receives a grant deed for their ownership percentage. Each owner also has title insurance for their ownership percentage. TIC ownership programs can involve up to 35 unrelated TIC investors. A TIC owner has the same rights, benefits, & risks as a single owner. A TIC owner s share in the property and its economic benefits, and risks, is generally equal to the percentage of their equity participation. 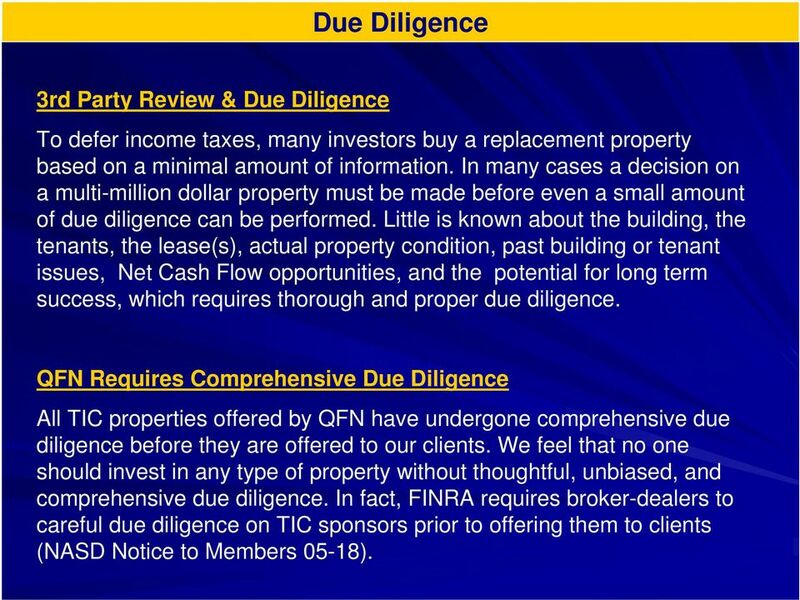 16 Due Diligence 3rd Party Review & Due Diligence To defer income taxes, many investors buy a replacement property based on a minimal amount of information. In many cases a decision on a multi-million dollar property must be made before even a small amount of due diligence can be performed. Little is known about the building, the tenants, the lease(s), actual property condition, past building or tenant issues, Net Cash Flow opportunities, and the potential for long term success, which requires thorough and proper due diligence. QFN Requires Comprehensive Due Diligence All TIC properties offered by QFN have undergone comprehensive due diligence before they are offered to our clients. We feel that no one should invest in any type of property without thoughtful, unbiased, and comprehensive due diligence. 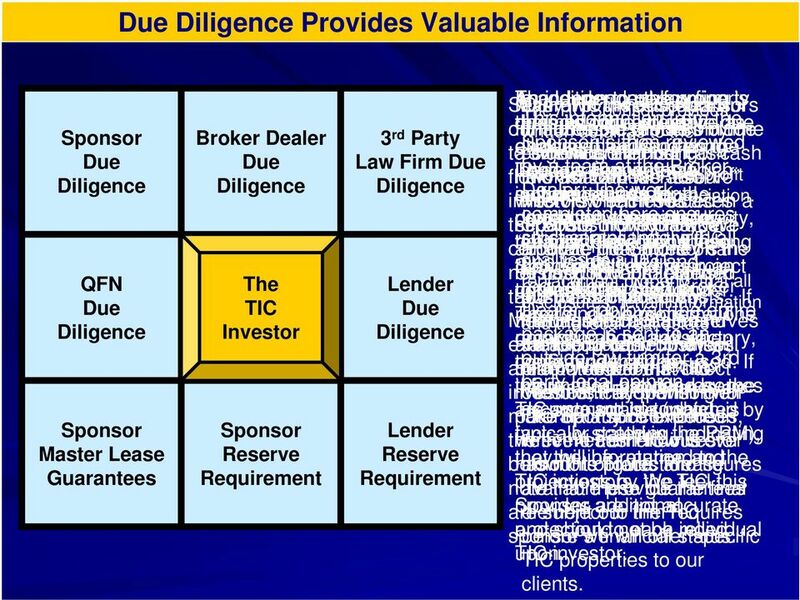 In fact, FINRA requires broker-dealers to careful due diligence on TIC sponsors prior to offering them to clients (NASD Notice to Members 05-18). 17 Due Diligence Provides Valuable Information Sponsor Due Diligence QFN Due Diligence Sponsor Master Lease Guarantees Broker Dealer Due Diligence The TIC Investor Sponsor Reserve Requirement 3 rd Party Law Firm Due Diligence Lender Due Diligence Lender Reserve Requirement Several In Many An The The Our addition independent lender TIC own TIC of Sponsor in-house the investments to on performing TIC the law provides Sponsors property team firm our is This information from the our their firm retained does written finalizes firm offers own its detail represents own to the due to thoroughly as extensive clients process diligence to the from include by due as time Sponsor is then reviewed to explained a analyze diligence, economics reviewing time significant will the focusing above, offer -- all TIC amount including this net offering. the on cash the cash income, by a team expenses, at the Broker flow Lenders held The lender s information. Guarantees law as Capital firm concerns, require writes We Reserve that also to net which a our profit comprehensive and Dealer. potential The for work investors. sufficient which include interview is issues often funds In each these invested of for appreciation. TIC legal cases the in a opinion In completed addition, the here sponsor property, ensures the project separate conservativeness, Sponsor be money individually. set will aside provide market security, for We a tenants, substantiates strict compliance projections, that the with TIC and all corporate Lender account. net analyze cash Reserve. flow, the guarantee The Sponsor s money and This the can long the Sponsor, term qualifies applicable viability as all a rules ending 1031 of the and net Lender be project in replacement history cash used of Reserve flow for transactions, both regulations. property, projected planned is After Broker that in all the controlled and unbiased to meet debt legal service. opinion disclosures, business Private unanticipated philosophy, by Placement the Lender. Dealer approval, tenant the information costs. If regarding the property. entire Memorandum. The the The management unused Lender the local capital has real team As discretion estate an reserves and opinion package is sent to an example, regarding are market, their accountable, long-term can property if how cash be and satisfactory, business condition, flow they when will confirming and outside contingency law that firm the plans for a for 3rd anticipated these be plan. returned funds We feel to to can be that the 7% be TIC direct used. to If information repairs party legal and maintenance opinion. investors, the investors. communication unused the By provided Lender Sponsor planning with reserves by the will for are the make are potential TIC accurate TIC accountable sponsor Sponsor up any and future difference is up combined supported expenses, to (which date. in is by the typically we fact with event feel --the or each stated scathing, cash tremendous TIC flow investor the indicating is ever PPM), below they has that amount more the will this information be of figure. protection. facts returned Please and and to figures the note TIC projections available investors. that these provide by We the guarantees TIC the feel final this are provides Sponsor element subject are additional our to not firm the accurate TIC requires sponsor s protection and before should we financial to will not each offer be status. relied individual specific TIC upon. TIC investor. properties to our clients. 18 Due Diligence Provides Valuable Information Comprehensive Due Diligence = Valuable Information Sponsor Due Diligence QFN Due Diligence Sponsor Master Lease Guarantees Broker Dealer Due Diligence The TIC Investor Sponsor Reserve Requirement 3 rd Party Law Firm Due Diligence Lender Due Diligence Lender Reserve Requirement According to various offering documents we have reviewed, the total costs for sponsor due diligence can range between $100,000 and $200,000, depending upon the number of due diligence firms that have been engaged by the selling group to perform such reviews. Even though they should, many real estate investors either can t afford to, or simply won t pay this amount before they purchase their individually owned, self-managed property. 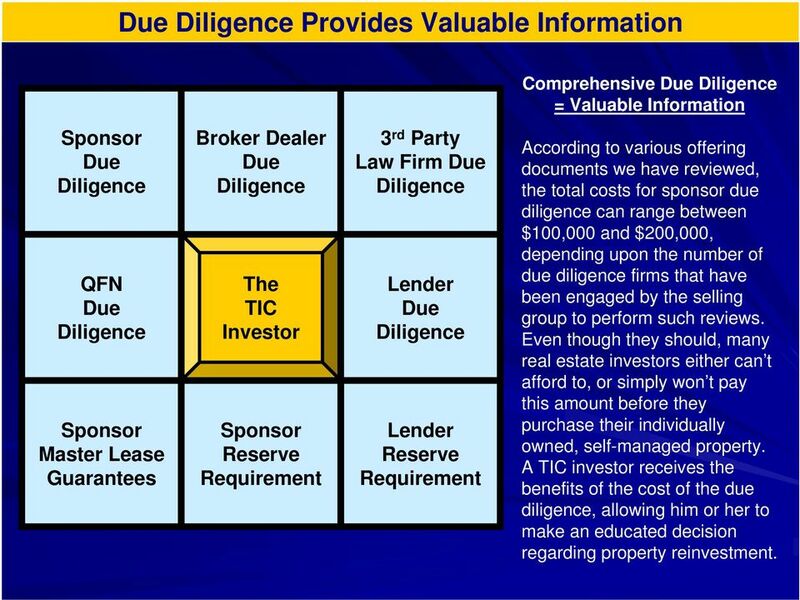 A TIC investor receives the benefits of the cost of the due diligence, allowing him or her to make an educated decision regarding property reinvestment. 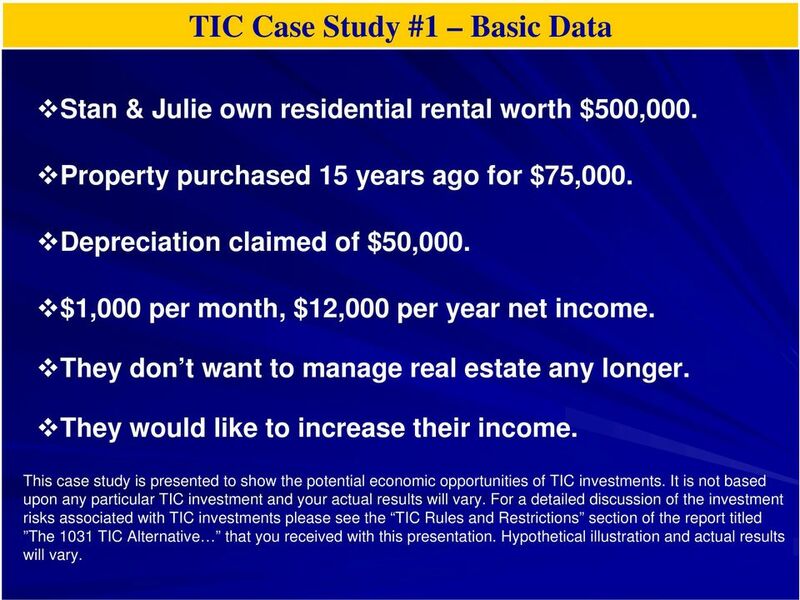 19 TIC Case Study #1 Basic Data Stan & Julie own residential rental worth $500,000. Property purchased 15 years ago for $75,000. Depreciation claimed of $50,000. $1,000 per month, $12,000 per year net income. They don t want to manage real estate any longer. They would like to increase their income. This case study is presented to show the potential economic opportunities of TIC investments. It is not based upon any particular TIC investment and your actual results will vary. For a detailed discussion of the investment risks associated with TIC investments please see the TIC Rules and Restrictions section of the report titled The 1031 TIC Alternative that you received with this presentation. Hypothetical illustration and actual results will vary. 20 TIC Case Study #1 Taxes Due On Sale Sales Price $ 500,000 Less Net Cost Basis ($ 25,000) Equals Net Taxable Gain $ 475,000 Federal Taxes Due On Sale $ 76,250 -Assumes 15% Federal Capital Gain Tax Rate. -Assumes 25% Federal Unrecaptured 1250 Gain Tax Rate. State Taxes Due On Sale $ 44,175 -Assumes 9.3% State Capital Gain Tax Rate. Equals Total Taxes Due On Sale $ 120,425 Hypothetical illustration and actual results will vary. 22 TIC Case Study #1 Summary 0% 1% 2% 3% 4% 5% 6% 7% 8% Net Net Net Net Net Net Net Net Net TIC TIC TIC TIC TIC TIC TIC TIC TIC Yield Yield Yield Yield Yield Yield Yield Yield Yield Annual TIC $ - $ 5,000 $ 10,000 $ 15,000 $ 20,000 $ 25,000 $ 30,000 $ 35,000 $ 40,000 Payments TIC real estate investment, in this case, decreases the income taxes by $120,425 this year and increases the annual net after expense rental cash flow by $23,000, and Stan and Julie do not have to manage their new TIC investment. There are loads, fees, and expenses associated with every TIC investment which must be considered before any investment is made in a TIC. Please review the section of our report titled TIC Rules and Restrictions for a detailed explanation of these costs. Hypothetical illustration and actual results will vary. 23 TIC Case Study #2 Basic Data Vince & Kim, age 50, own $3,500,000 commercial property. Have owned real estate for over 25 years and would love to get out of the landlord business. Purchased building 10 years ago for $1,500,000. Depreciation claimed Of $350,000. Current net income after all expenses of $95,000. Would like to increase net income to at least $170,000 so Kim can retire. Fix-ups will be required over next 5 years. This case study is presented to show the potential economic opportunities of TIC investments. It is not based upon any particular TIC investment and your actual results will vary. For a detailed discussion of the investment risks associated with TIC investments please see the TIC Rules and Restrictions section of the report titled The 1031 TIC Alternative that you received with this presentation. Hypothetical illustration and actual results will vary. 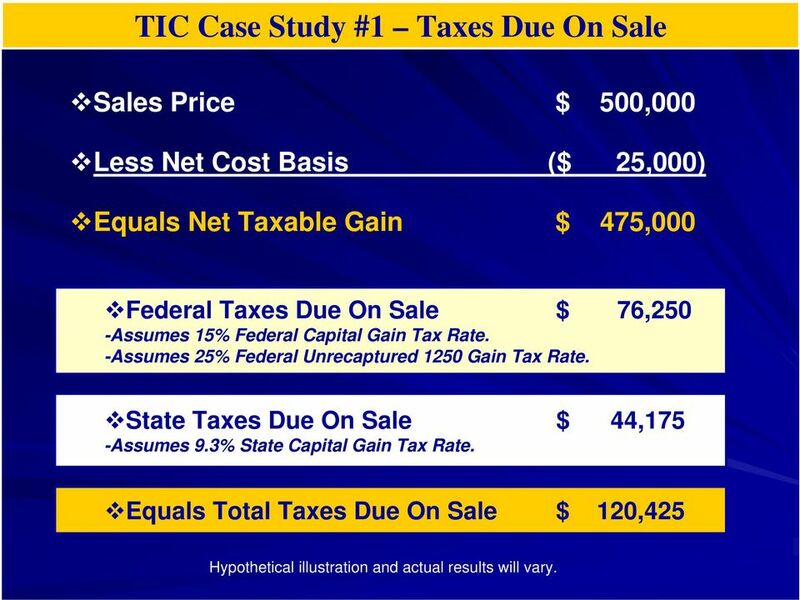 24 TIC Case Study #2 Taxes Due On Sale Sales Price $ 3,500,000 Less Net Cost Basis ($ 1,150,000) Equals Net Taxable Gain $ 2,350,000 Federal Taxes Due On Sale $ 387,500 -Assumes 15% Federal Capital Gain Tax Rate. -Assumes 25% Federal Unrecaptured 1250 Gain Tax Rate. State Taxes Due On Sale $ 218,550 -Assumes 9.3% State Capital Gain Tax Rate. Equals Total Taxes Due On Sale $ 606,050 Hypothetical illustration and actual results will vary. 26 TIC Case Study #2 Summary 0% 1% 2% 3% 4% 5% 6% 7% 8% Net Net Net Net Net Net Net Net Net TIC TIC TIC TIC TIC TIC TIC TIC TIC Yield Yield Yield Yield Yield Yield Yield Yield Yield Annual TIC $ - $ 35,000 $ 70,000 $ 105,000 $ 140,000 $ 175,000 $ 210,000 $ 245,000 $ 280,000 Payments TIC real estate investment, in this case, decreases the income taxes by $606,050 this year and increases the annual net after expense rental cash flow by $115,100, and Vince and Kim do not have to manage their new TIC investment. There are loads, fees, and expenses associated with every TIC investment which must be considered before any investment is made in a TIC. Please review the section of our report titled TIC Rules and Restrictions for a detailed explanation of these costs. Hypothetical illustration and actual results will vary. 27 TIC Case Study #3 Basic Data Joe & Mary own raw land worth $2,100,000. Purchased 25 years ago for $75,000. No current income from land, $6,000 of annual expenses. Would like to receive net income by $90,000+. Their single largest asset. They know they will have a large tax bill if they sell. Looked at a standard 1031 and found a replacement property that would provide $65,000 in net annual income. They like real estate but do not want to manage property. This case study is presented to show the potential economic opportunities of TIC investments. It is not based upon any particular TIC investment and your actual results will vary. For a detailed discussion of the investment risks associated with TIC investments please see the TIC Rules and Restrictions section of the report titled The 1031 TIC Alternative that you received with this presentation. Hypothetical illustration and actual results will vary. 28 TIC Case Study #3 Taxes Due On Sale Sales Price $ 2,100,000 Less Net Cost Basis ($ 75,000) Equals Net Taxable Gain $ 2,025,000 Federal Taxes Due On Sale $ 303,750 -Assumes 15% Federal Capital Gain Tax Rate. -Assumes 25% Federal Unrecaptured 1250 Gain Tax Rate. State Taxes Due On Sale $ 188,325 -Assumes 9.3% State Capital Gain Tax Rate. Equals Total Taxes Due On Sale $ 492,075 Hypothetical illustration and actual results will vary. 30 TIC Case Study #3 Summary 0% 1% 2% 3% 4% 5% 6% 7% 8% Net Net Net Net Net Net Net Net Net TIC TIC TIC TIC TIC TIC TIC TIC TIC Yield Yield Yield Yield Yield Yield Yield Yield Yield Annual TIC $ - $ 21,000 $ 42,000 $ 63,000 $ 84,000 $ 105,000 $ 126,000 $ 147,000 $ 168,000 Payments TIC real estate investment, in this case, decreases the income taxes by $492,075 this year and increases the annual net after expense rental cash flow by $150,060, and Joe and Mary do not have to manage their new TIC investment. There are loads, fees, and expenses associated with every TIC investment which must be considered before any investment is made in a TIC. Please review the section of our report titled TIC Rules and Restrictions for a detailed explanation of these costs. Hypothetical illustration and actual results will vary. 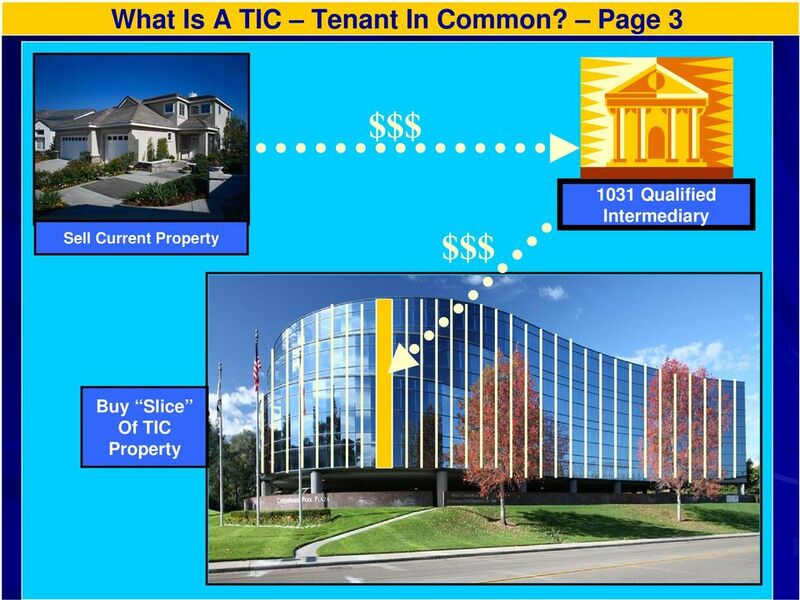 33 Why Consider TIC Tenant In Common Investment Page 1 A Tenants In Common ownership interest has a number of possible advantages: Viable Source of 1031 Replacement Property. Some Sponsors Have Low Minimum Investments. Quality Institutional Grade Commercial Property. The Potential for Competitive Cash Flow. Elimination of Daily Management. Timing To Fit Specific Needs Of Each Client. Quality Tenants. Tax Efficiency With Sale And Cash Flow. Turnkey Financing. 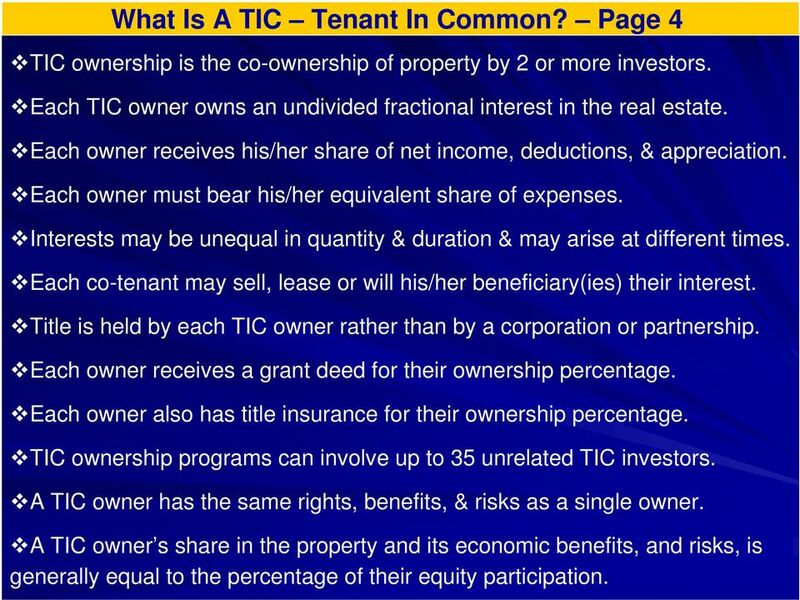 34 Why Consider TIC Tenant In Common Investment Page 2 A Tenants In Common ownership interest has a number of possible advantages: Diversification and Risk Reduction. Flexibility for 1031 Exchanges. Variable Investment to Match Your Needs. Appreciation Opportunities. Stepped Up Basis At Death. Notwithstanding these features, there are also a number of related investment risks that must be considered prior to investing. These investment risks are set forth in the TIC Rules and Restrictions section of this presentation. 35 Rules, Restrictions, & Recommendations - Page 1 TIC ownership is Actual Real Estate Ownership. The main difference is that instead of owning an entire property, a TIC owner will usually own a Fractional Undivided Interest of the property. TIC owners face many of the same investment risks that all other real estate owners face such as market risk, economic risk, location risk, and legal risk. While TIC ownership can potentially provide a real estate investor with significant economic benefits, it is very important to understand the limitations and risks of TIC ownership, such as: Lack Of Liquidity. Lack of Experience. Multiple Co-Owners. Capital Call If Reserves Used. 36 Rules, Restrictions, & Recommendations - Page 2 Interest Rate Risks. Costs and Fees. Income Tax Risks. Projected Cash Flow May Not Flow As Planned: Tenants being delinquent with lease payments. Costs to acquire new tenants. Extra expenses not planned for. Soft leasing market. Projected Appreciation May Not Occur As Planned: Lower gross and net lease income. Issues with tenants and leases. Property condition and maintenance. Weak real estate market. 37 Rules, Restrictions, & Recommendations - Page 3 The IRS Could Change The Laws Regarding 1031s And TIC Investment. 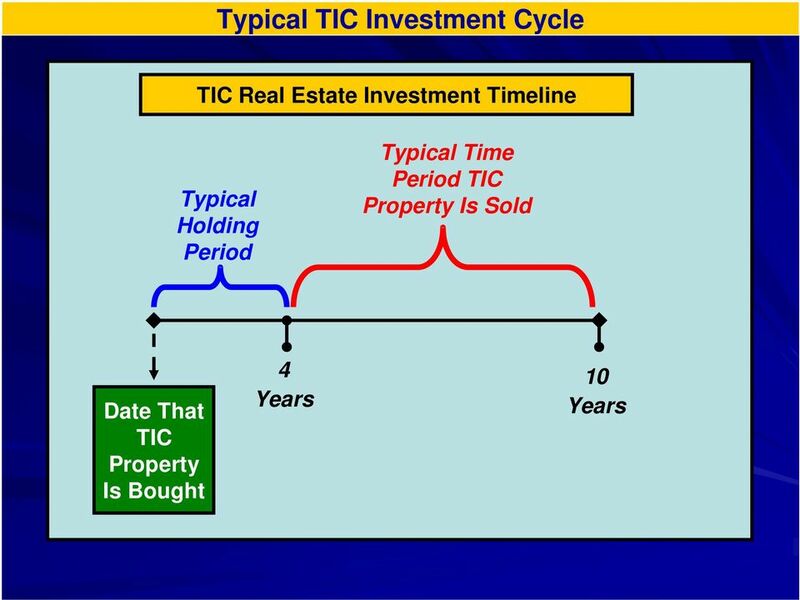 TIC Property Might Sell Out Before TIC Ownership Is Finalized. A TIC Sponsor Could Go Out Of Business Requiring New Management. Potential That The TIC Property May Not Close As Planned. If a lump sum of cash is needed, the TIC investor might have to sell his/her TIC investment. The investor could be liable for income taxes on the previous gain deferred into the TIC property, plus any appreciation that happened to occur on the new TIC property. 38 Rules, Restrictions, & Recommendations - Page 4 Investment Expenses When an investor purchases real estate, whether individually or as a TIC, there are many costs and fees associated with acquiring, managing, and selling the property. For TIC real estate investments, upfront costs and fees are referred to as a Load, annual ongoing expenses are called Management Fees, and expenses associated with the ultimate sale of the TIC property are called Exit Costs. These items are explained in tremendous detail in the Private Placement Memorandum for each specific TIC property. Q&A with Natalie Choate: Buying Real Estate from a Self-Directed IRA Natalie Choate 06-09-06 Natalie Choate is the author of "The 100 Best and Worst Planning Ideas for Your Client's Retirement Benefits,"
Survey Specific Stats. (19 out of 32 or 59%) are structured as preferred equity.